My son is traveling and I have been bugging him to find me some T3 action. He was in Beirut and I thought he might get lucky and find one there. 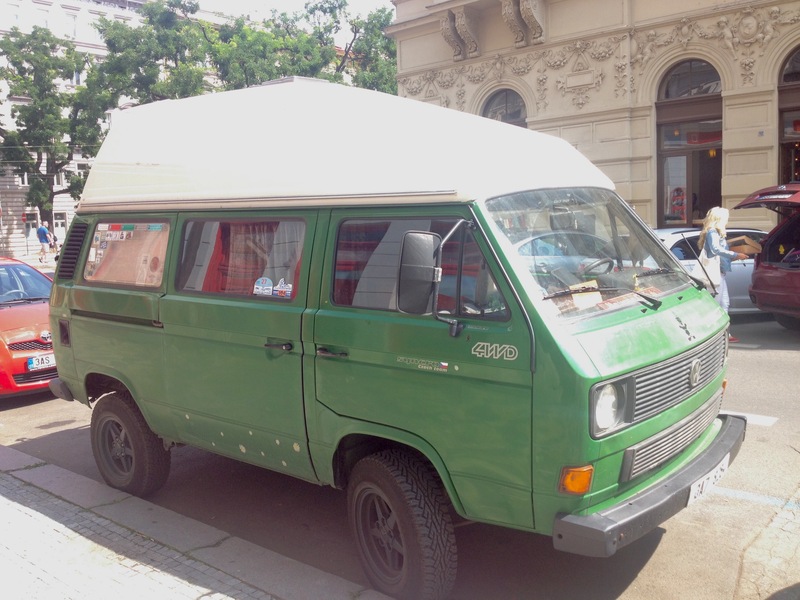 Nope, but he came through with this nice syncro high top in Prague. I very much like the sticker on the front door, “syncro Czech team”. This entry was posted on August 6, 2016, 8:29 am and is filed under syncro, vanagon. You can follow any responses to this entry through RSS 2.0. You can skip to the end and leave a response. Pinging is currently not allowed. Any sign shop should be able to do it reasonable price too . We have 4 shops in Vernon within a stones throw of my shop . That’s not a Joker, is it? They had a more uniform look. I have no idea. To my great disappointment 🙂 my son has really little interest in cars. You think your offspring will be little mini-me’s but they don’t work out that way. And if you think about it that’s a good thing. I enhanced the image and searched by image. The only thing that comes back similar is your WordPress picture. It’s not a Joker. The range of high tops in Europe is confusing. What I will do is post a link to the two sites I know of that makes an attempt to list them. Thanks for trying though, I do appreciate the feedback. Hi there, my name is Tomas, and the Syncro Czech Team label is my idea. I very much like the Czech team sticker layout and design. I Hope you don’t mind my doodling with other countries using your layout. I’ll ask now for permission, if I ever get around to it :-), to make a team canada version. May I?